It’s here! I’m the first in Texas and all of the Southwest to receive the new 532nm handpiece for the PicoSure laser which is used to specifically remove red, yellow and orange tattoos. I acquired this somewhat costly new attachment in order to provide patients’ with the best technology available as part of my commitment to quality laser tattoo removal. The PicoSure laser 532nm handpiece emits a powerful green laser light which is highly absorbed by red & yellow inks and their variations like pink and orange. It’s interesting to note that red appears red because it absorbs green and reflects red light. This means that the green-colored laser beam energy produced by the new handpiece will be absorbed by red tattoo pigments and cause them to fragment. 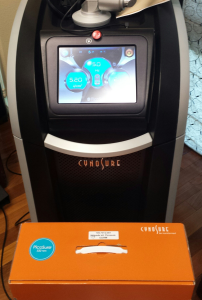 Then the PicoSure PressureWave will further destroy the ink by shattering it into the smallest of particles which can be easily removed by the body. The handpiece will be installed onto the PicoSure platform this week and fully calibrated to ensure safety and efficacy. Next week, I’ll personally attend a PicoSure training and educational event to ensure that I am highly qualified to operate the new 532nm handpiece and understand its various settings and technical specifications. Proper education, training and experience are paramount within the healthcare setting because I believe that patients’ deserve the finest care possible. If you have a tattoo removal that requires destroying red or yellow ink, or one of their colorful variations, and you would like it safely, quickly and professionally removed with the brand new, state-of-the-art 532nm PicoSure handpiece, I can be reached by phone @ 512-479-9997 or just stop by my NEW location in Austin, TX: Austin Medspa on W. 6th St.